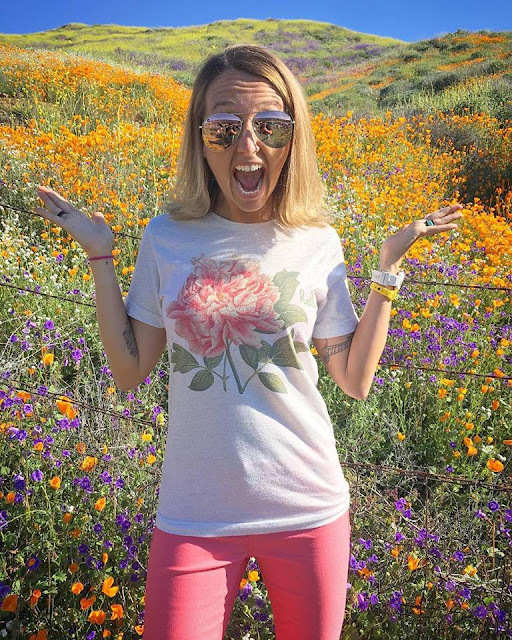 If you follow me on social media (you can find me @CarleeMcDot on all platforms), you may have noticed that the hubby and I went out to see the "superbloom" yesterday morning. What you may not have realized (especially if you either don't follow me or you just look at the pictures and don't read the captions) is I didn't want to go. Like not in the slightest. Don’t get me wrong, I big puffy heart L-O-V-E nature, flowers, etc, but I knew not only would the poppy fields be a mad house but people would be destroying God’s creation, making me frustrated, annoyed and disappointed. Let’s just say I wasn’t wrong... the flowers were gorgeous, but the people were terrible (not all, but definitely the majority we saw). I like it when you call me BIG POPPY! The only reason I went was because the hubby was actually really excited to go, so I decided to take one for the team and stock up on a few extra "good wife points" ;) I mean, I even had to go as far as to wake up at 3:45am so I could get my 10 mile run in before we made our way to the poppy fields. That's what you call love (or maybe insanity ;)). Had to start running by 4:45am so I could be home by 6:45 and showered and ready to go by 7:30. I was actually pretty surprised that the hubby wanted to go, because he HATES crowds and lines - and I figured that's exactly what we were walking into... And, I was right. Think of it as Disneyland crowds when Star Wars Land opens. all of the people that look like lines of ants coming up the hills?! POPPYGEDON! We left our house around 7:30am so we could get to Lake Elsinore before 8:30. (Technically we could've went earlier, but the poppies don't open up fully for a few hours after sunrise, so we were walking a thin line of when to go so we'd beat the mad-dash of people and yet not get there too early so we wouldn't see them in all their glory.) As soon as we got close to the exit we could already see the pandemonium. Sure, the hills were gorgeous and covered in orange and purple, but the lines of cars and hordes of people were very disheartening. I could already feel my cynical side coming out. We originally got off at the main exit, but as soon as we got off we were directed right back on the freeway because the parking areas were full. We decided we'd drive down to the next exit, take some of the side roads and then just walk in. In fact, it got so bad that the city of Lake Elsinore had to SHUT DOWN the canyon! Literally, the freeways and side streets were at a standstill! In a statement city hall released, they said "#PoppyShutdown: The situation has escalated beyond our available resources. 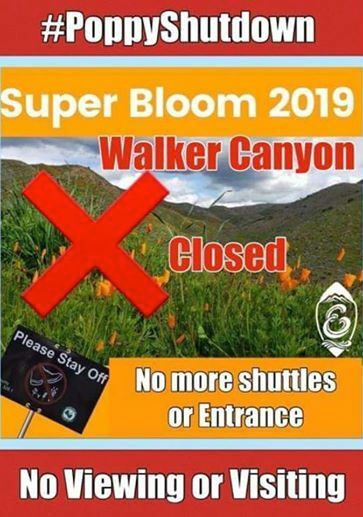 No additional shuttles or visitors will be allowed into Walker Canyon. This weekend has been unbearable. We will evaluate all options next week including ways to shut this down. Thank you for your understanding. We know it has been miserable and has caused unnecessary hardships for our entire community." I get it, public lands are for the public to enjoy, and although at one point I literally said out loud "I sort of wish these people would stay home and not #OptOutside", I really do want folks to take pleasure in the great outdoors... but I don't want them to destroy it. I want everyone to be able to enjoy it - that includes future visitors! Sitting or lying down to take a selfie or even walking off an established trail can damage both existing flowers and the next generation that would have grown if the soil hadn’t been disturbed. You may think it's not a big deal, but multiply that act by tens, hundreds or thousands of visitors and it can quickly destroy an area! We need to be respectful - period! On our walk back to the car we came across this artist painting the hills. Sort of loved it! If you are planning to check out the superbloom (or anywhere in nature actually), visit responsibly. While I encourage everyone to take in the incredible sights of God's creation, I hope we will all be a responsible visitor while there. That means walking on marked paths only, taking photos in front of the flowers rather than on top of them, and otherwise leaving no trace. In fact, while we are at it, let's leave it better than we found it! If you see a piece of trash, pick it up. If you come across a ranger or employee, thank them for their hard work. And wherever possible, make as little an environmental impact as possible (carpool, visit during an off-season, look into ways of volunteering, donate, etc). And, with that, I will step down off of my soapbox (although, let's be real, I could go off on this topic for quite some time!). What is one way you will leave it better than you found it? I can relate to this so, so much, Carlee. I love the outdoors and all the public lands and National Parks, but I get really sad when I see the hordes of people these days, a majority of them being irresponsible when they visit. I wanted to weep into my morning coffee when I found out last year that they were building a guard rail at Horseshoe Bend (AZ) because people were so crazy at the edge of the canyon. It not only destroys the views, but also the "wilderness" of the place.